WARNING: This product can expose you to chemicals including Nickel (Metallic), Ethylbenzene, Diisononyl phthalate (DINP) and Styrene, which are known to the State of California to cause cancer, and 1,3-Butadiene, Toluene and Bisphenol A (BPA), which are known to cause birth defects or other reproductive harm. For more information go to www.P65Warnings.ca.gov. 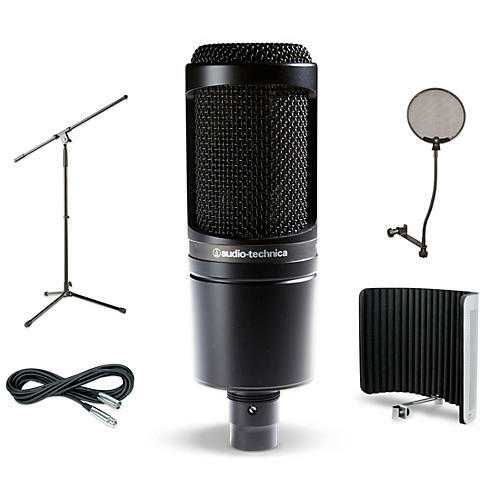 Special pricing on a fine studio microphone along with all of the essential accessories you’ll need to get a quality signal to the board. Along with your AT2020 microphone, you’ll get a Musician’s Gear tripod boom stand, a Gear One 20’ XLR microphone cable, a Musician’s Gear pop filter and a CAD VocalShield VS1 reflection filter. The package is rounded out with an MGTBS Tripod Microphone Boom Stand that is adjustable height from 35" to 61-7/8”, and a 20’ Gear One XLR microphone cable.